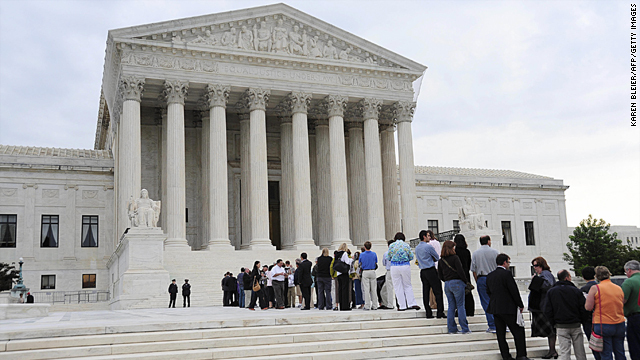 What role might the Supreme Court play in the next presidential election? Suddenly the Supreme Court is looming large in yet another presidential election. In the 2000 contest between George W. Bush and Al Gore, the High Court ruled the recounting of votes in Florida - remember those hanging chads - must stop. Al Gore got about 500,000 more popular votes. But the Supreme Court gave Bush the edge in Florida - and he went on to win the election. That decision effectively handed the presidency of the United States to George W. Bush. Flash ahead to 2012. Twice within the last four weeks, the Supreme Court has agreed to hear cases - health care and immigration - that could have huge implications for the outcome of another presidential election. Court watchers say the justices seem to be leaning toward rolling back part - or all - of President Obama's hallmark legislation of his first term. The individual mandate appears to be in serious jeopardy - and with it, the whole law might go. Then, almost without missing a beat, the Supreme Court decided to hear arguments on Arizona's tough new immigration law. It's no secret the federal government under Presidents Obama, Bush - go back as far as you like - has made virtually no serious effort at securing our nation's borders – especially with Mexico. Finally being fed up, Arizona took matters into its own hands. Interestingly it looks like the Supreme Court may side with Arizona. And again the implications could be huge. Both rulings are expected in June - just a few months before America elects its next president. Republicans will use any decision against President Obama as ammunition. However if the president loses either of these cases it could become a perfect way to mobilize the Democratic base, including Hispanic voters. Here’s my question to you: What role might the Supreme Court play in the next presidential election? A major role. If they strike down the health care bill, it will be a serious body blow to the president. It was the only thing he accomplished, meaningless as it is. If the Supreme Court overturns Obama’s health care reform and his lawsuit against Arizona on illegal immigration then it will tell the world, not just people of the Unites States, that the president, a lawyer, is not the sharpest pencil in the box - and that his side of Congress, which wrote the law, isn't either. It would be a big slap in the face to Democrats. Could be they'll reprise their year-2000 role as Republican spoiler: except this time it's not chads hanging in the balance, it's 30 million uninsured American lives. Flesh and blood, not partisan ideology. Big, colossal, gigantic, a Romney killer. If the Arizona immigration law is upheld, the large Hispanic community will turn out in force to vote for Obama. If you don't get that, your combination plate is missing everything but the beans. If the Supreme Court rules against the health care bill and in favor of the Arizona immigration bill, it will be a blow to President Obama's credibility. Jack, The Supreme Court will play a major role in the next presidential election because conservatives must elect a president who will nominate future justices who will follow the Constitution. The decisions pending will reveal that the Obama administration not only does not understand and follow the Constitution but tries to change it. The fix is in. 2000 all over again. The Supreme Court might have election observers to observe polls and what matters more that a true count is made. They could throw out the electoral collegee that can overide a popular vote something that was done in the early years of our country because those in charge thought the general public was not smart enough to make a sound educated vote. Yes they could do either one or both but they won't they will just keep their benches warm. The Supreme Court has already played a BIG role in the election by letting the wealthy give any amount without telling who is giving it. Next they are going to mess with the Healthcare Plan so we can't have the Insurance. They are going to mess with the Hispanics. What more can they do to help the Republicans that gave them a job for life? Jack: I hope the Supreme Court has no role in the next election. The last time the Supreme Court got involved in a presidential election the people got a real headache. President George W. Bush was the worst president since President Warren G. Harding and Calvin Coolidge. Harding was immoral, Coolidge was dull, and George W. Bush was stupid. We need a president who the people elect not someone appointed by the Supreme Court. Al Gore might have been a terrible president, but at least he won with more peoples votes. It's hard to say Jack, considering probably only 10% of Americans pay any detailed attention to what the Supreme Court does or even why it exists. Total apathy and ignorance. We have turned into an entertainment obsessed nation where the top subjects on our minds are "Who will win American Idol or Dancing With The Stars". Every politician knows this.....................and they love it. Technically the Supreme Court Plays No Role in elections . They are supposed to support the Constitution and Federal Laws. However many Federal Laws are simply wrong and unconstitutional . The Government has gone wild and insane in many cases and many people clearly see this. Several pending cases could show Obama to be an extremist President and this could in fact swing indepedent voters away from him. His base will nearly always love him, but independents elect Presidents . He may loose due to his ideology . He is viewed as socialist by many independents . Jack the Supreme Court GOP judges pushing for the republicans and want to divide this country or make us into third world country or into fifth country. I hope they understand that American people pay their income and pensions. I would imagine, cast their Vote as the rest of the Country. Jack: That is a no brainer-–None. Obama will get re-elected by a significant margin-–unless Mitten request a "recount." Pivotal Jack, absolutely pivotal. The Court's decisions on Obama's health care and his suit against Arizona on immigration are the keys. Should they vote in his favor, he's got 4 more years. If they go against him, he's back on the sidewalks of Chicago. The fact he chose to castigate the Court during an earlier State of the Union address has to be on his mind. If the Supreme Court rules against the Health Care Bill and in favor of the Arizona Immigration Bill it will be a blow to President Obama's credibility. At the present, the presidential election would be close. And if the election is also close in a key state; stop the recount before the recount is finished–repeatedly. Until the High Court has a chance to meet and to decide the election for the correct party. The only concrete impact the President can make on the future of the country, is to shape the mix of the Supremes. It's a defining reason to vote one way or the other this election. Hopefully it will play no part. But you know Roberts and his buddies will stick their nose in it because they can. If the SCOTUS overturns Obamas healthcare reform and his Lawsuit against Arizona on illegal immigration then it will tell the world not just people of the Unites States that the president, a lawyer is not the sharpest pencil in the box and that his side of congress who wrote the law isn't either . It would be a big slap in the face to democrats and will have an effect on the next presidential election because it will give the republicans something to rub in their faces. They might be so activist that they stop the vote count and hand the presidency over to the loser. Nah! That could never happen. Progressives are very worried. Two of the liberal justices are old and in ill-health. The conservative judges are fairly young and in good health. Odds are the next President will need to replace some of the liberal justices. If Romney wins and makes the appointments, we'll have an activist Supreme Court that wants to take the nation back to 1861, for the next 30 years. If the Koch brothers and Rove can manipulate a cliff-hanger based on the ALEC-led voter identification rules, the Court will give the election to Romney. Turnout for Obama is going to be light, especially among young voters. He has not delivered on some of his main promises from 2008. A major role. If they strike down the Healthcare bill it will be a serious body blow to the president. It was the only thing he accomplished, meaningless as it is. And since the right-heavy clown court is intent on destroying American life as we know it, from the Bush appointment to Keloe to Citizens United, this healthcare thing will be on life support until they pull the plug. And pull the plug they will. I think worst case scenario for Obama and his team, is they get personally and historically embarrassed, if the Supreme Court rules against Obamas positions in the coming months. I don't think the Supreme Court can tactically overcome the will of The Republican Establishment to lose the 2012 Presidential Election. Speaker of The House John Boehner is looking paler every time I see him on TV. A parties most powerful player should not look so distraught. No matter what happens between now and the election, Obama will just blame it on the Republicans and enough people will buy that line to insure Obama a second term. Doug, Pepperell, MA. The US supreme court has only one role, to follow the US constitution. These that think that they where nominated to be in the highest court of this United states to trash our constitution, play politics or force their ideology into the citizens of this country, are traitors, they betray their oath and the people of this United states. Could be they'll reprise their Year-2000 role as Republican Spoiler: except this time it's not chads hanging in the balance, it's 30 million uninsured American lives. Fleah and blood, not partisan ideology. So please don't destroy–just because you can–gentlemen and ladies, what it's taken from Roosevelte to Obama to legislate. Big, colossal, gigantic, a Romney and party killer, that is if the Arizona immigration law is upheld by the politically appointed justices. The large Hispanic community will turn out in force to vote for Obama. If you don't get that, your combination plate is missing everything but the beans. The supreme court could rule that it is a conflict of interest for someone who is owned by wall street like obama, or romney to run for president. U.S. presidential elections have become one big auction. Obama and romney will each have about 1 billion dollars to spend telling you how much they will change things to make your life better. The 99% electorate is either too dumb, too stoned, or too disinterested to elect candidates who actually will do something about the 50% of new college graduates who can't get a job, the millions of people who are facing foreclosures, the 13 million people who are unemployed, the 12 million illegal aliens, the trillion dollar defense budget with endless wars or threat of war with iran or syria, or the bonuses for ceos of banks and wall street firms who received a 30 trillion dollar bailout from the fed. They should each cast their single vote at their polling station just like the rest of us. However, I fear this court's penchant for conservative judicial activism will get the better of them. They have a full range of options, ranging from disallowing the candidacy of President Obama to abetting GOP voter suppression to disenfranchising entire states. Who knows what these over jealous hacks might do. The Supremes, really need to be voted in by the people and only by the people. Judges are supposed to call balls and strikes.......now, they pass judgement, and set laws by their political ideology. See how well Citizens United is working.....justice for sale!! As it did in the elections of 2002, the U. S Supreme Court will play the role that it was staffed to play, and that is to rule on matters before it in the same partisan fashion with which it's members were appointed . Unfortunately, the majority will attempt to rule in ways that support the positions of the party that appointed them. I think its obvious, They guranteed that our political system can be overthrown by allowing Unlimited Payoffs through Super Pacs accomodating unsustainable special interests that drown out the peoples demand for moral leadership with sustainable policies. The supreme court is about to do what we already know to be the truth completely discredit the Obama administrations full term. What does he have to stand on after they do the only thing they can strike down everything they tried to force down the americans throats. This administration is a total failure! Now thats change we can believe in. If the Supreme Court has to get involved in the election Mitt Romney will be our next president. True colors will once again be shown by the so called justices that will not "uphold" the Constitution. Hopefully, they would do the right thing and state that Arizonas immigration law is unconstitutional regardless of the upcoming election. Maybe we should cut the Supreme Court and save a lot of money, then eliminate Congress. They have 9 votes so I doubt if their vote will sway the next election unless there is another fiasco like Bush vs Gore. That was a real travesty in American justice and we are still paying the price for their "unbiased" decision, that's a joke. Well After the Bush debacle I could see another close call where Obama wins and the Supreme Court sets it aside based on the electoral colleges unwillingness to certify the election. The Supreme Court is NOT suppose to play ANY role in presidential elections, Jack. The fact that they handed GW Bush his first term verses allowed the states to complete recounts and verify voting machine malfunctions meant that they over stepped their counds and legislated from the bench. Let's hope that we do NOT see a repeat of that again. God only knows what Americans will do if that happens again..
God only knows. I'm sure if there is any possible way they can assist the Republicans, they will. Look at the 2000 election. They stopped the counting of votes. STOPPED THE COUNTING OF VOTES! And, in the end when the votes were counted anyway, it turned out Mr. Gore won Florida. But it was too late. Here is a scenario which could happen. Chief Justice Roberts recently divested himself of Pfizer stock in case of a pharmaceutical question coming up before the SCOTUS. It's been in the media about certain drug shortages because drug companies have freedom to be profit-driven, without allowing for shortages of critical drugs. So....what if there is an unforeseen drug shortage prior to election time which is flu season, causing chaos and deaths, and the Supreme Court is asked to put the question of drug company freedoms in the forefront? That should cause a new angle of health care discussion, right at election time. I think the Obama campaign will definately use Supreme Court nominations as a 'talking point" to fire up the Democrate base. they will point to the 5-4 "Citizens United" ruling as an example of what happens when the court is packed with so called "consevative activist judges". and they will be CORRECT because "the four horsemen of the conservative apocalypse" supreme court justices, Roberts, Scalia, Alito and Thomas have proved thru their rulings that they could CARE LESS about "past precedent" in their rulings. AND they are the LAST WORD and are there for LIFE!!! I don't see much Supreme in this court, Jack . The only role they must have is the law and only the law( not the GOP agen'da), if they want to help us then outlaw the Super packs. I'm 64 and my Dad is rolling over in his grave at this country. We can only hope "not much." The decisions coming down this summer on health care and immigration will, I think, have little effect on the election itself. Most of us already have an opinion on both, and a pretty good idea of whom we will vote for in November. And, alas, the last time the SCOTUS had a hand in deciding an election (2000) they gave the "win" to the actual "loser." So much for their collective "wisdom." SCOTUS needs to stay out of elections. When they high jacked the election for Bush, look what happened to the country. There needs to be a better way to select the judges, and get rid of the "position for life" rule. Throughout my life I had the highest regard for the Supreme Court as the final arbiter in the most significant disagreements between American citizens. In 2000 my confidence in the Court was shaken by their monumental blunder in annointing GWB president. Since then the Court has veered dangerously right, particularly with the addition of the two Bush appointees. After Citizens United and the two pending cases I have lost all respect for the Supreme Court. It no longer fulfills the role intended by our founders but has become a hot bed of extremist right wing juducial activism. The end of deomacracy in America is at hand. Jack you missed the Supreme Court's greatest politically leaning decision – Citizen's United – you know, corporations are people and they can contribute unchecked into SUPERPACS. The Supreme court justices in my opinion need to have checks and balances applied to them too since they appear to be disregarding the constitution they are supposed to uphold. The voters need to be able to vote on whether they stay on the bench – just like we vote on our representatives. No electoral college rules either – purely a majority vote. With any lock Obama wont be aloud to run .The democrats can get a reel american human to run. chuck paree anderson in. A huge role. When the Republican majority upholds the Arizona immigration law, that will send a huge message to Hispanics and Latinos. The Supreme Court will have almost no impact. It's the economy, stupid! The Supreme Court could have a significant impact on this election. If the decisions come down 6-3 against Obama It may well be a fatal blow to his re-election chances. If they are 5-4, and clearly partisan, it may energize independents and legal immigrats to vote for Obama. If they vote to uphold the laws, Obama is a shoo-in. Rep. Joe Walsh and Rep. Joe Wilson will file suit to invalidate the results of the election after Obama wins, on the grounds that his birth certificate is fraudulent. They will be supported by Michelle Bachmann and Rep. Alan West. Donald Trump will file an amicus curae brief. The Supreme Court will find in their favor. Soon thereafter, Mexico will have to build a wall to keep Amedricans out. It is the ECONOMY and JOBS that matter not whether or not we have a 50 ft tall wall between us and Mexico that matters. How about this, instead of building this wall just put all the unemployed people in those bordering state on the line between us and Mexico and PUT PEOPLE BACK TO WORK!!! Jack, if the Republicans had their way, there would be no election. just an appointment of a right-wing GOP leader by Scalia and the gang. This whole Democratic process is a waste of time to them. The SCOTUS has screwed things up so badly with its decisions on Bush v. Gore and Citizens United, who cares? The Justices have proven they're just another group of partisans ready to benefit their party and not the people of the United States. Very sad. Hi Jack, this Republican controlled Court is having a major impact on this election. Their Citizens United Decision held that property, a corporation, is a person with rights. That’s as crazy as the Dred Scott Decision holding that a person, a slave, is property with no rights which led to a Civil War and the Civil War Amendments. Corporations are spending hundreds of millions on this election and people are voting for Obama with an eye on the next Supreme Court appointment. Actually, Jack, as of now, I wish the Supreme Court could play an even bigger role in the 2012 elections. Put a crimp in Obamacare then whack the Obama administration on the side of the head for not addressing our borders and not enforcing the issue of illegals in this country and, finally, I would hope some group would file a class action suit against the entire Congress for not addressing our ills now and those to come in the not too distant future like Medicare, Medicaid, Social Security, excess spending on useless wars, and so and so forth. It is pitiful what is happening in politics today. The one and only issue for those in office is "get elected" again. To heck with our real problems. This is the same group who authorized Citizens United. Done. I think it will mobilize voters on both sides of the political spectrum in opposing ways, depending upon their point of view of these issues. My problem is with the Justices, themselves. No longer do the justices of the Supreme Court interject statements during the hearings to play devil's advocate. In the more recent hearings before the court, the Justices take up much of the time, that should belong to the opposing attorneys, to actually make their partisan case. They appear to have already made their decisions and are trying to use their own arguments to sway the court and public opinion. As long as President Obama has a clear and concise victory in November the Supreme Court won't have a say. Whatever role they can, Jack. Whatever role they can. The Supreme Court could make President Obama look like a successful leader if his programs are supported by the Court, or they could make him look like a wimpy lame duck president that can't accomplish anything. "But where is the 'Turn-Court' thinking in all this, Jack?? Where is the 'Double-Jeopardy' in all this, Jack?? They call it a 'Twist' in the final chapter; which I might say has to be written by me!" The Supreme Court's decisions on Obamacare and AZ immigration law highlight the problems that Obama has brought upon himself with the average American in the last 3 years. In one (Obamacare) he went way too far and in the other (illegal-iimmigration) he hasn't done anything at all. Americans are looking for some middle ground on both. Hopefully the Supreme Court will not pay any role in the election (2012) But are we also talking about the AZ immigration law here. Once again is this States rights vs. Federal rights. Is Obamacare in line with the constitution? I for one am so sick of politics. If they aren't corrupt at the start it doesn't take long for the power to go to their heads. Jack, this Supreme Court has become a joke. This Supreme Court rules with a Political Agenda, whether than actually following the Constitution to the Law. I say it's time we rewrite the rules and give them a term limit just like we do Politicians. They are a joke!!! The current Supreme Court had devolved into yet another lobbying arm for Wall Street (along with the GOP). Their recent decisions will ensure that no matter who wins in 2012, the ordinary citizens of America will lose. I don't know about this election, Jack, but I sure do know about the 2016 election...NONE! After this conservative court does away with affordable health care and ratifies the immigration laws of Arizona, the president will be swept into a second term where he can hopefully balance the supreme court to better mirror american society, a liberal ,tolerant progressive society I might add. In this case, a loss is still a loss for the Obama Administration. Only the Obama Administration would spin either case as a win, Jack. If anyone thinks the Supreme court is not partisan, they're not being realistic. The Court decided the election in 2000 and may do it again. Voters need to mobilize, get the votes out and make sure their voices are heard. You have great insight, Jack! What this means is that 5 (Conservative) members of the Supreme Court are going to do everything they can to see that Barack Obama is not reelected. It's unfortunate that these folks are appointed for life terms. It's the only way the Republicans will win is if the Supreme Court ignores the popular vote once again. We need to thank the Supreme Court for the mess this country's in today. When did the Supreme Court become the voting booth for Americans? About the same role it played in the Gore/ Bush 2000 election. Let's hope that they will be good boys and girls and remain in their seats (of power) while election- mania is taking place. They should only speak after they raise their hands and are given permission to do so. Did I just hear the school bell? With the possibility of the Supreme Court siding with the States on immigration and rolling back most of President Obama's laws there is no doubt in my mind they will take the final vote in the election to favor the Republican nominee. So what do you suggest they do? Refuse to hear a case brought to them simply because it may effect the President? I do find it interesting that this will probably break down according to party lines. Is the Court crooked too? If something is unconstitutional, then it is. No matter what side of the aisle you are on. There is no gray area here. What role might the Supreme Court play in the next presidential election ? Answer : This sort of reminds me of when I used to keep up with Professional Boxing, back in the Days of Ali / Fraizer / Foreman / Norton & etc. – Now Days, I hardly know Who Is boxing anymore. I know it doesn't sound right, especially when Gore got about 500,000 more Votes. But Our Election Process isn't about "the most popular vote" Jack. SO – again, it's like boxing, You've Got to Knock OUT the Champ, Before you are Considered the WINNER. In Other Words : IF GORE would have CARRIED MORE STATES – then the Supreme Court wouldn't have to Make That Decision. In Other words, Since Gore couldn't do the Knockout Punch, It had to rely on a decision that a lot of people may or may not want. The role they will play, it will be giving Obama the first kick out the door of the White House. I cannot say how bad he is. He is a total loser, everything he has done has been a loss for the REAL AMERICANS. He has not done one positive thing. The Hypocrisy, and the corruption of this guy is unreal. There is not enough room, or enough time to write down here today the damage he has caused America.Yes The supreme court will open the door for Obama to lose again.Then he can move to Europe since he likes socialism so well. The Supreme Court will play a major role in the next presidential election because conservatives must elect a President who will nominate future justices who will follow the Constitution. The decisions pending will reveal that the Obama administration not only does not understand and follow the Constitution but trys to change it. Jack,before we think about what the SCOTUS might do to the next election,they need to answer for the destruction they caused to the USA when they installed W into the White House. Jack – the Obama administration wanted to have these two cases heard by the Supreme Court before the election and is going to use the decisions regardless of whether they are upheld or struck down. If Obamacare is struck down in whole or part; or if Arizona's immigration law is upheld, the Democratic party is going to use that as a rallying cry. If Obamacare is upheld or if Arizona loses, they get to claim victory. Either way the Supreme Court is being used by the current administration. On healthcare it shouldn't matter. I'm saving over 100.00/mo, but don't like the mandate. Immigration may prove costly to the republicans. A better question is why do we need the Supreme Court. It's not interpreting law, its legislating law by voting alone party lines. It just an extension of congress. I think the SCOTUS decisions will have a big impact, but not like the conservatives realize. It will make clear to everyone that the Supreme Court has become a puppet of the conservative republican machine. The conservatives will sit smugly briefly, thinking they now have the upper hand in the election, until they realize the the Court' decisions have incited not just the progressives, but the independent middle class voters, and effectively hand Obama the election. Well jack i think the Electoral collage is unconstitutional. i feel that every vote counts and the supreme court should get involved. if it did rule it unconstitutional it would have changed things as we know it, like bush would never have made the bone headed move like getting countless thousands of men and women killed in iraq. we wouldnt have have lots of other republicans in office racking up the dept, as well as getting more men and women killed in a needless war. do you see a trend in what i am saying? Jack, You are comparing apples to oranges. Okay, maybe Macintosh to Granny Smith. The Bush high court decision was about the election itself - the hanging chad. The potential Obama rulings are in regard to political issues which may or may not affect the president. Yes, Obamacare is directly on the President's agenda but the immigration law is a culmination of YEARS of frustration in Arizona. It didn't start the day Obama took office. I think that neither decision during the Obama term will affect the election outcome the way the Bush decision did. In the Bush decision he was literally allowed to steal the election from Gore. Neither the Obamacare or immigration decisions will . Jack; I read all the comments and am amazed at how many people really did not read your piece and have no clue what the question was about. Not withstanding, If the Supreme Court rules against the Affordable Healthcare Act it will infuriate the Democratic base and probably lead to unintended consequences for the Repubs. The POTUS will be re-elected and the people will give him a heavy majority in Congress to work with. As a consequence, we the People will have single payer across the board. I am from Sarasota, FL and love my Medicare. btw, we pay premiums too. Since the constitution is moot, should not they be labelled the "Imperial deciders"? After all, what we have here for a long time is a polyRoyalty in a majority of the elected/appointed elite positions. Not sad, tragic and coming to your neighborhood soon if not already. Not much of one, even in the unlikely event they don't consider mandates to be allowable under the taxing power, which is plenary under the 16th Amendment. Oil is going down and housing is stabilizing, taking the economy off the table as an issue. It likely won't even be close, unless Obama is challenged from the left by an Americans Elect candidate,which does not look too likely right now. Well,since Bush v Gore, who the heck can rely on anything from the USSC? I know that the Court declared that vile 2000 decision was NOT to be considered a precedent for future rulings, but, this Robert's court completely ignores precedent and established law anyway. It doesn't matter what they said in 2000 and your guess is as good as mine. Will they toss out the vote and install Romney? They just might do this if 'continuing to count the vote threatens Romney's claim to be the President-elect' (which is what the Bush team basically successfully argued in Bush v Gore)! Nor do I expect anything coherent or remotely Constitutional to come out of 5 of the 9 "justices" since Bush v Gore and Citizens United. What a bunch of partisan hacks! The Supreme Court is the ultimate reality that Presidential elections have consequences. However they rule should wake up voters to be careful who you put in the White House. Hopefully none Jack. Hopefully Barack Obama wins by a wide enough margin as the lesser of two evils. Although even if that occurs, I'm sure the Republicans will still try to find some way to invalidate the results. the Supreme Court to guide their feeble existence. When? It's already started. This regime can't write executive orders that tramble on individual rights. It's called checks and balances and scales of justice are swinging back in favor of individual liberties. The Supreme Court will play a role just as an umpire plays a role in a baseball game. The losing team is the one usually blaming the ump. They're not supposed to play any role in the election, Jack. Their job is to say what the law is (Marbury vs. Madison, 1803). Does it mean that the Supreme Court doesn't screw up? Of course not. They've made some bad decisions in the past–Dred Scott decision (pre-Civil War decision that held that blacks, whether free or slave, cannot be US citizens), Plessy v. Ferguson (separate but equal–which gave the US apartheid), Koramatsu (legal to put US citizens of Japanese descent into concentration camps during WWII), Bush v. Gore (gave the Presidency to Bush), and Citizens United. They can mess it up again. If they were smart, they'd have postponed hearing both of these cases (healthcare and immigration) until after the election. If you mean what their decisions in these cases can mean to people voting in the election and how the candidates will spin them, that's a whole 'nother debate. Regardless of the decisions, it will fire up the bases of those who support the legislation, perhaps impelling more people to vote. Answer : The deciding factor in this election is going to end up with the sunshine state & the 17th State to enter the Union, Jack. the suprenme court will play no role in the election there ,there to do a job ,, nott to make a out come for any presdient there in place to protect the ppl for the ppl not to judge the predincy.